The Colorado Crush have been a staple in the IFL since its inaugural season in 2009. Founded in 2006 as the Colorado Ice, the team played in the United Indoor Football league. In July 2008, the UIF merged with the Intense Football League and formed the current Indoor Football League. 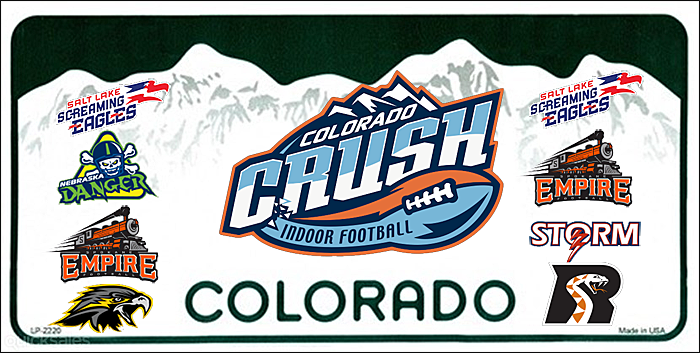 In July 2015, the Ice were re-branded as the Crush, one year after the trademark of the Colorado Crush of the Arena Football League team expired. The change was initiated by owners Tom and Patty Wigley, who purchased the team in 2010. Last season, was an emotional roller coaster for the franchise as Tom Wigley put the team up for sale, citing health reasons. On the field, the Crush finished the first half of the season with a disappointing 0-8 record. Despite their winless mark, 5 of their 8 losses were by 8 points or less. In their ninth game, the Crush would earn their first victory, a 61-47 victory over Wichita Falls, and went on to finish the season at 4-12. In its 11th overall season, the Crush begin a new chapter under a new ownership group called Project FANchise, taking over for the Wigley family. FANchise, who also own the Salt Lake Screaming Eagles, will incorporate fan votes into the Crush's 2017 operations, from choosing the team's head coach, roster, and in-game play calls. The fans voted on Jose Jefferson as the team's head coach, replacing Heron O'Neal after five seasons. After a Week 1 bye, the Crush will kick off the 2017 IFL Season with back-to-back home games, beginning on February 26th at the Budweiser Events Center for a Sunday matinee against the expansion Salt Lake Screaming Eagles. 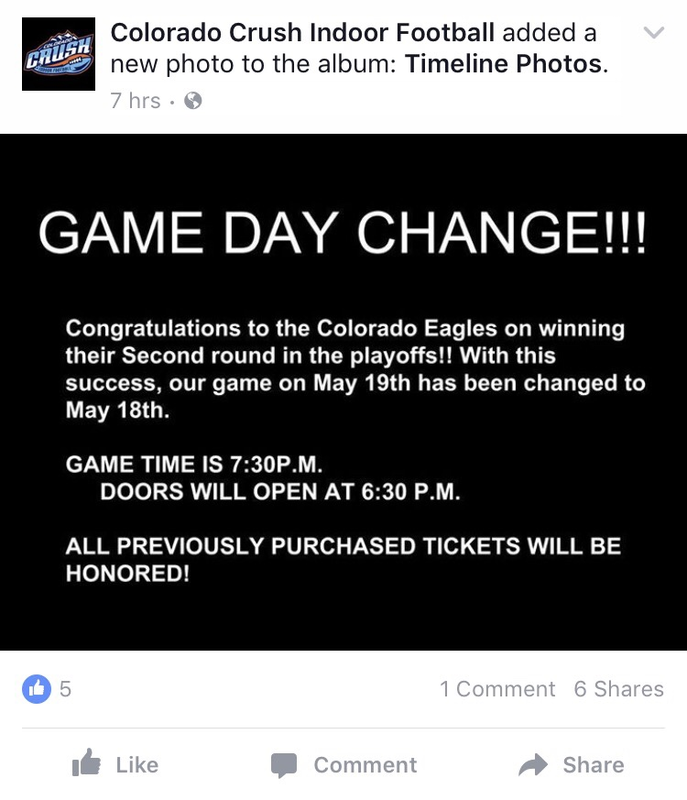 Colorado will follow up with another Sunday afternoon game against the Nebraska Danger. The Crush then hit the road to take on the Arizona Rattlers, entering their first season in the IFL after 24 seasons in the Arena Football League. Although the Crush are not associated with the Colorado Crush of the AFL, it'll mark the first time a franchise called the Colorado Crush plays a game in Phoenix, AZ since the 2008 AFL Season. After a short road trip, the Crush return home to take on the Intense Conference Champion Spokane Empire. They will then hit the road for the next four weeks with early season rematches at Nebraska, Salt Lake, and Spokane. Colorado will make its long awaited return home April 21st against the Wichita Falls Nighthawks. The Crush will finish out the rest of the regular season playing at home and on the road in alternating weeks, battling the Iowa Barnstormers and Sioux Falls Storm, in addition to rematches with Wichita Falls, Spokane, and Salt Lake before eventually closing the season at home versus Arizona. The Crush, who play in the Intense Conference, will play the Empire and Screaming Eagles four times during the season, while facing the Danger and the Rattlers twice each. The Crush will play 3 of the 5 United Conference teams, with two games versus the Nighthawks and single meetings with the Sioux Falls Storm and Iowa Barnstormers. They will not face the Cedar Rapids Titans or Green Bay Blizzard this season. The IFL's schedule provides that all 10 teams plays 16 games (8 home/8 away) over 18 weeks, with each team getting two bye weeks. The league's regular season will begin Thursday, February 16 and run through Saturday, June 17. The following is Colorado's 2017 schedule (times reflect the Pacific Time Zone (PST)). Bold Carolina blue designates home games). You can catch all Crush games (and the weekly coach's show) locally in the Loveland/Fort Collins area on KFKA (1310 AM). All IFL games, including the playoffs and the United Bowl, are streamed on YouTube (YouTube.com/IndoorFootballLeague). In a way, adding the Crush to our site is like a tribute to Tom Wigley. I really like this. Schedule change for the Spokane/Colorado game next week. Colorado Eagles, who play in the ECHL and are a minor league affiliate of the Colorado Avalanche, are playing in the Western Conference Finals vs Toledo. They have guaranteed home dates on Wednesday and Friday. If it's not a sweep, Game 5 would be on Saturday. Hence the Thursday bump. 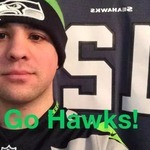 And they did not move the game to Sunday because Spokane already has plane tickets purchased and they cannot be changed. They will arrive that Thursday morning at 10 and then play at 7. Could be a really long day for Spokane. That is good for the Crush.